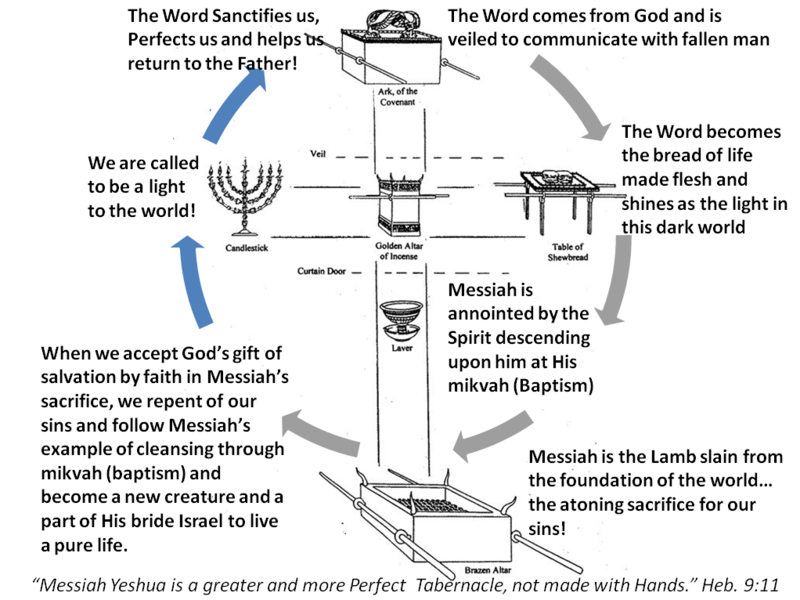 In this study we see the beautiful symbolism within the Mikdash (Tabernacle) that reveals Yah’s Plan of Salvation through Yeshua and shows us how God desires to “dwell” within us and what Selfless love looks like when Divinity “dwells” in Humanity! Trumah (תְּרוּמָה‎)— Hebrew for “gifted contribution” or uplifted “offering,” is the nineteenth weekly Torah portion in the annual Jewish cycle of Torah reading and tells of God’s instructions to make the Tabernacle and its furnishings. The parashah constitutes Exodus 25:1–27:19. 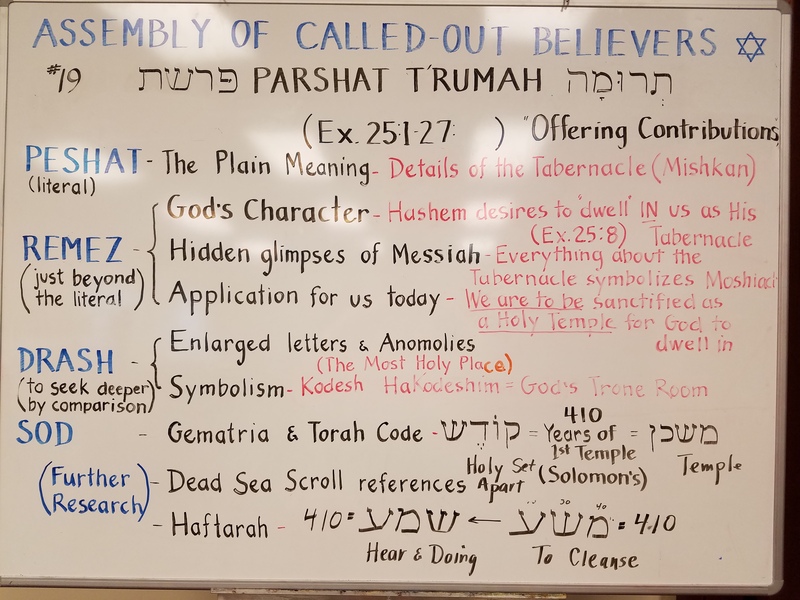 T’rumah whiteboard – In this study we see the Beautiful symbolism within the Tabernacle that reveals God’s Plan of Salvation from the beginning! On the summit of Mount Sinai, Moses is given detailed instructions on how to construct this dwelling for God so that it could be readily dismantled, transported and reassembled as the people journeyed in the desert. The Way back to the Father is the Path we take from going through “The Way”, accepting the atoning sacrifice of the spotless lamb of God for our sins (Justification), which Justifies the Ungodly when accepted by faith (Justification by Faith), the Laver symbolizing our cleansing us as we seek to die to self and the false ego and cleansing our consciousness of the knowledge of sin. As we enter the Holy Place, we enter into the process of our spiritual growth and character development (Sanctification) realizing first the need for the Spirit of Truth which leads us into all truth (Isa. 8:20, Jn. 16:13; Jn. 17:17) and shines through us and makes us a menorah as a called-out believer (Rev. 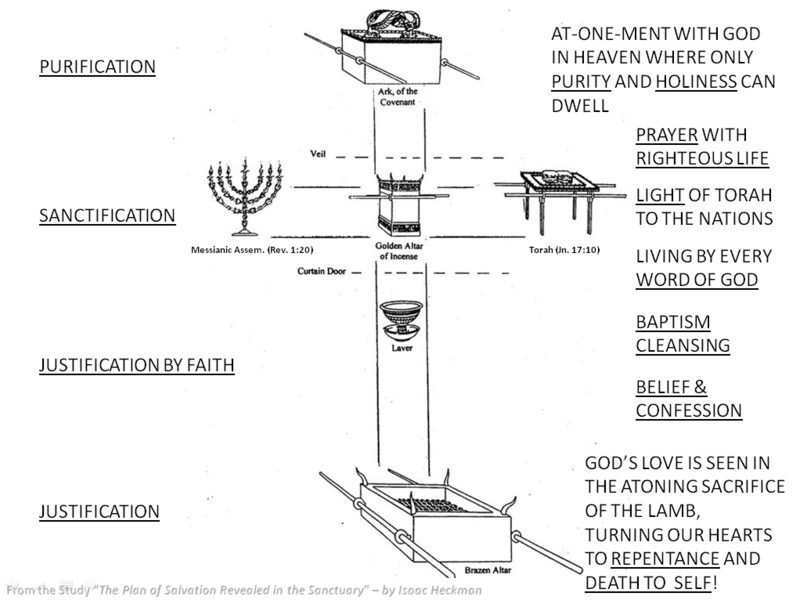 1:20), secondly, the Spiritual bread symbolizing our need for the Torah instructions in how to love and draw near to God and our fellowman, and thirdly, the alter of incense with represents our need for righteous prayers to ascend as a fragrant aroma continually before the Holy One. Finally, after having Torah fully written upon our hearts and minds and fully transforming back into the selflessly loving image of God (Jer. 31:31-33) we can go through the veil and be “At-One” with the Father in holiness and purity in the Most Holy Place… us in Him and Him in Us! This week’s haftorah describes the construction of the Holy Temple under the direction of King Solomon, echoing this week’s Torah portion which discusses the construction of the Desert Tabernacle. The haftorah discusses the manpower — both Jewish and non-Jewish — that Solomon recruited for the building of the Holy Temple. Also discussed are the hewing and transportation of the stone, the laying of the foundation, as well as the dimensions of the Holy Temple, its components and materials. Write us and let us know what you think! We hope this Torah teaching blesses you in your spiritual understanding and growth! Also if you have a need for prayer, please write us and let us know how to pray for you and we feel privileged to be intercessors in prayer for all our worldwide family! Torah Parashah teaching with video and audio and illustrations by Pastor Isaac. © 2019 Assembly of Called-Out Believers. Use by Permission.